Even if you love IncrediMail, you may be forced to switch to Outlook one day. Why? Because IncrediMail looks too... incredible for many corporate standards. Although that does not mean you should lose data, does it? Give this tool a try. IncrediMail to Outlook Transfer scans your HDD for IncrediMail files and automatically transfers all the contents to a brand new PST file of Outlook. The process is automatic, fast and safe. This is arguably the best way to migrate from IncrediMail to Outlook today. IncrediMail has always been a bright alternative to regular business-oriented email applications. Unlike its peers coming from the corporate world, IncrediMail featured colorful themes, countless email decoration options, animated notifications, smiley collections and other small details that helped it stand out from the crowd of email exchange products. This was also the main reason why IncrediMail often became the choice of the creative types and people who wanted to liven up their email communications and add some bright colors to every message sent by them. This, however, also became the key obstacle to the wide acceptance of the program in the corporate environment. IncrediMail lacked many advanced features sought for by business users and simply didn’t appear business-like enough to be installed on employees’ workstations. This is why many fans of IncrediMail were forced to migrate to more conventional solutions, such as Microsoft Outlook, which is the standard email application in the majority of companies across the world. This task, however, cannot be accomplished using standard tools or built-in utilities due to substantial differences in the formats used by both applications. IncrediMail to Outlook Transfer is a convenient tool offering a full set of functions for smooth, fast and hassle-free conversion of IncrediMail data directly to Outlook or a standalone PST storage file. IncrediMail to Outlook converter program is a leading solution of its type combining an advanced core, a user-friendly interface and unparalleled efficiency of extracting data from healthy and corrupted IncrediMail *.IML files. No matter what you want to do: convert IncrediMail to Outlook, extract IncrediMail messages to EML files or move IncrediMail emails into solid PST file – all that possible thanks to the semi-automatic IncrediMail data transfer module which turns the hard task into an easy ride. IncrediMail to Outlook Transfer is a compact and easy-to-use tool that automates the process of converting data from IncrediMail v2.5 format to Outlook *.PST files, multiple *.EML files or directly to Microsoft Outlook. Since IncrediMail stores messages in a database-like format and keeps attachments in a separate folder, manual conversion is simply off the table. IncrediMail Transfer software helps solve the email migration problem in a few quick steps. * – Default Message Store can be detected automatically. You have to select Message Store manually in case if IncrediMail was configured to use multiple Identities (accounts). ** – Software setup package installs both editions (32-bit and 64-bit) at once. Thanks to its intuitive and straightforward interface, the program is completely suitable for users of all skill level, from rookies to professionals dealing with email migration on a regular basis. If you have never done anything like that and don’t know how to convert IncrediMail to Outlook PST, relax – the program is as user-friendly as it gets! IncrediMail to Outlook converter module helps users migrate from IncrediMail to Outlook in just a couple of clicks without leaving the program. You don’t need to look for the source files on your own – IncrediMail data transfer utility will do it for you and will locate both the message databases and associated attachments! The tool requires no training, special knowledge/skills or prior experience with IncrediMail to Outlook conversion software – the whole process is as easy as 1-2-3! Unlike many competitors, the program is an all-in-one solution, which means that you won’t need any additional utilities to extract or prepare the data. If you are lost, disoriented and just need the job done ASAP, there is no better choice than IncrediMail to Outlook Transfer! IncrediMail data Transfer software saves time and money. Even one-time application pays off, but if you help users with IncrediMail to Outlook conversions on a regular basis, savings will impress you, compared with what you’d usually spend on third-party services. 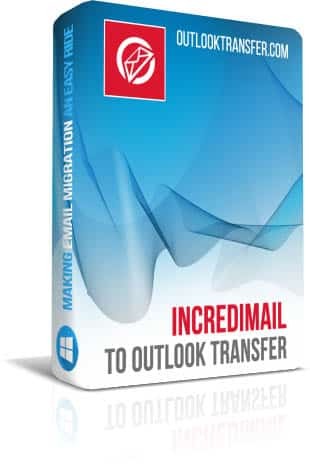 IncrediMail to Outlook Transfer works with IncrediMail message storages of any size and converts them into all major versions of Microsoft Outlook with a single click! Users see a detailed log of operations performed during each data migration session, which makes it easier to troubleshoot issues, should they arise. The software takes care of the encoding of your messages, thus ensuring that they remain 100% readable after migration to the target system. IncrediMail to Outlook Transfer comes with a free trial version offering the functionality of the full version, yet limiting the number of objects processed each time. How to transfer emails from IncrediMail to Outlook without losing data, time and money? IIncrediMail to Outlook Transfer is the one solution for all of your IncrediMail to PST conversion needs. Created to be simple, user-friendly and truly helpful, it makes ultra-fast email migration a reality. For users migrating from IncrediMail to Outlook, it means speed, comfort and safety of their data. For system administrators, IncrediMail to Outlook Transfer translates into considerable savings and minimal time spent on data conversion. Whatever your case is, this handy tool is definitely worth a try, no matter how hard the task of converting emails from IncrediMail to Outlook may appear initially. How to convert IncrediMail contacts to Outlook? Your comments, suggestions or ideas will be very valuable as we do not stop to make improvements to our software. Please feel free to post your rating and review about IncrediMail to Outlook Transfer product using the button below. We really appreciate your feedbacks. I wanted to thank you all for a superb product! I want to thank the team of this compagnie, and special Robert for the support I get by the transfer from IncrediMail to Outlook. If the world was as this team there was no anger. Just a quick thank you for the excellent service that you have provided. It was very straight-forward and all my e-mails were converted from Incredimails’s IML format to Outlook’s PST format perfectly. quiero adquirir incredimail to outlook transfer. con solo adqurir el incredimail to transfer podre transferirir todos mis correos y contactos a outlook? I used the software to transfer folders from Incredimail to Outlook. It worked well. I'm quite satisfied with the software, it's going smoothly and straight forward in IncrediMail to Outlook trasferring process. It is the only one out there that can do the trick. You may use our on-line conversion service for less price. Please contact us for details. Meu amigo tem a ultima versão do incredimail registrada, a poucos meses atrás estava com mais de 7GB de aquivo agora só aparece 3GB. Sugeri para ele migrar para o outlook. Você tem uma pessoa especializada em incredimail para fazer um acesso remoto para fazer uma analise da situação? The only reason why I purchased IncrediMail conversion tool is because I needed to extract my emails from IncrediMail at my old system and put them all to the Outlook as I moved to a new computer. The only way I could figure out how to move them was to buy a tool like your's which do all these things automatically. So I am a pretty much happy now. I have very old IncrediMail XE version installed at my computer. Downloaded your converter but can't find the way to make it work. Looks that this tool is not for my needs. Must to let you know that I have completed the conversion from Incredimail to Outlook and am very pleased with the performance of your software. The whole procedure took less than an hour and worked seamlessly.